On the road, we all fell asleep. Sleeping on the road is a very normal thing to us, but our guide was surprised and cannot fathom the thought how we could sleep on bumpy roads... we told him, it's like being lulled to sleep on a rocking chair, he laughed in disbelief. We later realized that the locals do not actually have the luxury to experience riding a car or van, the motorcycle is their usual mode of transportation, surely you can't sleep on it, can you? 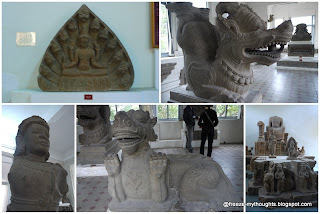 Last stop was the tomb of emperor Ming Mang, it reminded me of Beijing's Ming Tomb with a courtyard guarded by statues of mandarins, horses and elephants, but in a much smaller scale. The resting place was carefully planned by the emperor himself and built shortly after his death in formal Chinese style, it's opulent and exotic, and a good example of classic Sino-Vietnamese architecture. The place was deserted and felt very eerie. 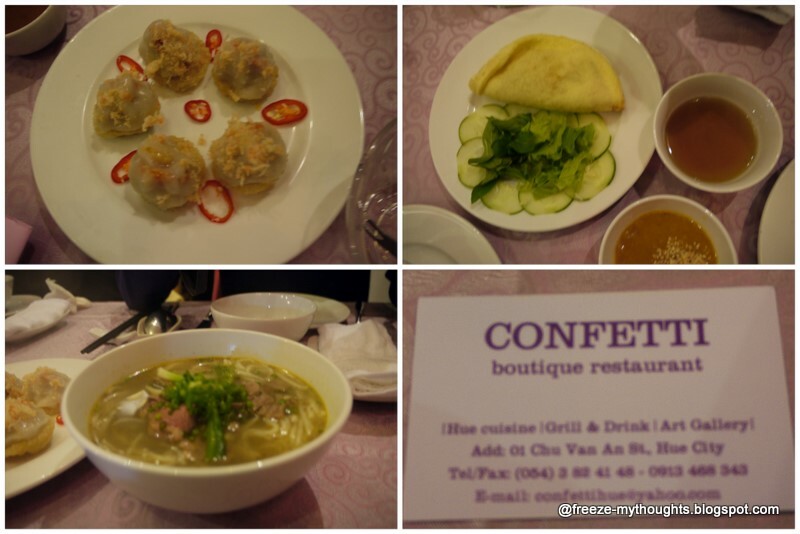 For dinner, we took the taxi to Confetti Boutique Restaurant as recommended by trip advisor. 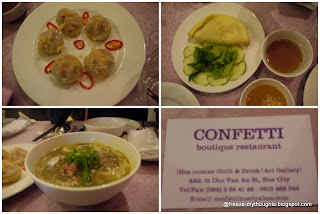 The place has a great ambience, the table set in all pink, the food was great, and the Vietnamese pancake was a hit. It was a long climb up those hundreds of huge steps to Marble Mountain, that was definitely painful on the legs for the unfit like me. At the top, you'll see an overview of five limestone peaks with marble outcrops known for their beauty and their cave network. At the foot of Marble Mountain, is an important religious site since the time of the Chams, you can see many artisans crafting fine marble objects. We went in a temple carved inside a cave - that was impressive. We also walked and climbed up and down further to see the Pagoda. Here, we found an elevator; but it was still under construction, i guess we came too soon. Da Nang appears to be a more progressive city, with a long stretch of beach. I don't know if they're prettier than our beaches here, but they are way ahead of us in terms of development, tourism and attracting investors. Mile and miles along the coastline were cordon off to make way for massive development by several five star resorts of international brands. Two to three years from now, they'll definitely make a name. I'm in awe yet envious for our country.